Designed to match the successful 60-tonne capacity Minetruck MT6020, the new Scooptram ST18 completes Atlas Copco’s range of underground loaders in this segment. 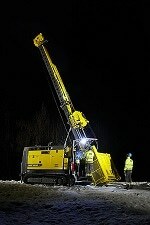 The new 18-tonne capacity Scooptram ST18 completes the Atlas Copco range of underground loaders in this segment. In addition, the ST18 and the MT6020 share many common parts and control system components, which can substantially reduce total cost of ownership. The bucket and the unique boom design combined with variable displacement pumps provide safe and efficient operations. This, together with the proven Atlas Copco Rig Control System, which monitors, supports and controls all aspects of the operation, results in superior muck pile penetration, less wear and tear on the machine and an overall faster and more productive loading cycle. The operator sits in a spacious FOPS/ROPS-approved, air conditioned cab and has extra leg room thanks to the unique Atlas Copco footbox. The layout of the controls is ergonomically optimized and visibility is best in class even towards the rear, thanks to the sloping design and shorter power frame structure. All of this contributes to an outstanding operator experience and improved productivity. The Scooptram ST18 has an abundance of safety features, such as automatic brake test, protection guards, 3-point access system, redundant steering system, safety latches, boom lock up, fire suppression systems, machine protection system and more. Furthermore, it can be equipped to run semi-autonomously or by radio remote control. Beyond this, the new loader offers many sustainable solutions that contribute to maximized uptime and a long service life. For example, automatic ride control and automatic declutch to increase the lifespan of the equipment and to reduce spillage from the bucket. Automatic traction control reduces tire wear and fuel consumption and the addition of soft stops on the boom, bucket and steering which reduce wear and tear on the machine. The ST18 comes with a number of Atlas Copco Service products that contribute to trouble-free operations. One example is the RigScan, an advanced audit service product that offers a real-time, non-intrusive look at the equipment’s running condition and performance. Another example is the Remote Monitoring system, making production and maintenance data available through a user-friendly web interface. In addition, Atlas Copco offers a training program consisting of classroom, simulator, and on-site training. By using the sophisticated Scooptram ST18 training simulator, new operators are given plenty of opportunity to practice on machines and systems before entering the mine.